The Cosco multi-purpose folding lap activity tray combines form and function, offering a small space solution for many household and work needs. 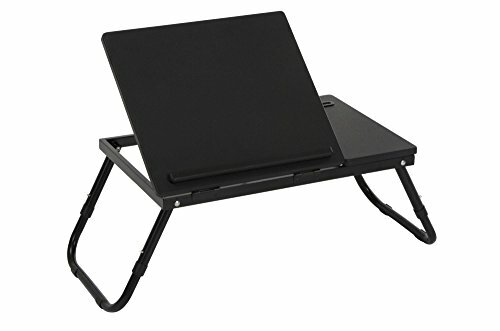 This tray allows you to work from your laptop or tablet at multiple viewing angles. A raised lip on the edge of the adjustable Section holds your electronic device while the stationary platform allows for additional work surface for writing or holding a drink. Legs on the tray fold easily to store under the bed, couch, or in a closet when not in use. Manufactured of resin and steel this activity tray is easy to clean and durable for many uses. Measuring 20 inches (W) x 12.5 inches (d) this folding lap activity tray is large enough for all your computer, tablet, or eating needs.